The following review was conducted in May 2010, and information on subsequent software updates and new version releases may not be reflected within. This review predates OnSIP’s mobile app for iOS and Android, free to OnSIP users, so is not affected by bias. Mobile VoIP for business is a fantastic concept. 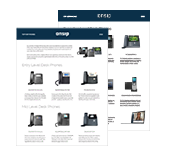 You download a SIP client on your mobile phone, configure your VoIP provider account settings, and BAM!—you’re hooked into your office phone system. Now you can make calls with your company caller ID and reach coworkers with extension to extension dialing without using your own minutes.